My tale of three cities: The Hague, Rome, Dubai. 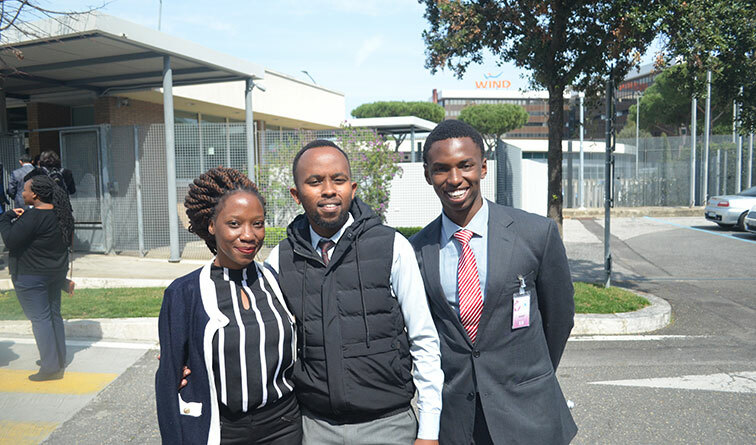 From Left: Isabella Wambutha, Joseph Njung'e and Michael Ngunjiri outside the World Food Programme Headquarters in Rome on 1st April 2019 during the Strathmore Law School Academic Trip. It is the 23rd of April late in the afternoon and I have just awoken from my afternoon siesta after an arduous 2 hour-long cardio session earlier in the day. My bags are packed and in my sleepy stupor, I check the time and it is about 4pm. Take-off is in another 6 hours and I hail a taxi. Soon after I am at the airport having coffee with my friends waiting for the rest to arrive so that we all check-in. Amidst the banter, I reminisce on how in my first year the Dean of the Strathmore Law School told us about the trip. Fast forward to three months before the trip, we are having a briefing on how to fill the Schengen visa documents. My walk down memory lane is disrupted by the arrival of my fellow classmates. Later on in the evening, we have all checked in save for a few late fellows who, nonetheless, make it in time for boarding. Seated in the plane, it all seems surreal as I look around and see my classmates chattering away on the way to Dubai. Being a frequent flyer, it all seems normal but I must say that flying aboard an Emirates plane is an experience in and of itself. The food is noticeably better and the flight crew much warmer, I am proudly Kenyan but Kenya Airways should take a few tips. A few hours later and I am standing next to a coffee vending machine at the airport in Dubai trying to decipher what 1 Dirham looks like and the fact that I am unable to sleep on a plane makes this otherwise simple task rather daunting. After further fumbling, I am successful in getting a rather small amount of cappuccino and then later seated on a bench with a friend looking at people from all walks of life walking by silently sipping the bland machine made coffee. Daylight is upon us and I am soon walking into the gangway leading to the next flight. The flight to Schiphol is long and at some point, due to lack of sleep, I stare blankly into an endless sea of clouds just counting miles to the Netherlands. At this point, I am on energy-saving mode as I have my passport stamped at immigration. In my Maasai shuka, I get a few glances coming my way and when we finally leave the airport, I am suddenly awoken by the cold crisp air, and I see electric vehicles whispering about in utter silence. People are milling about, catching taxis and buses and it hits me that I am in Europe. Moments later, it is evening and I catch some sleep but the excitement bubbling within me to explore supersedes my sleep and I am out and about looking for food and new sights. My first experience at MacDonald’s was underwhelming, the highly celebrated Big Mac left a lot to be desired at least on my tongue. Dinner is served at a local Italian restaurant, but at this point I am too exhausted to enjoy the food or any other experiences. The next morning, waiting outside our hotel, I appreciate the Nairobi sun. At The Hague, the Sun only serves as a source of light and not as a source of heat as I am accustomed to. I whip out my camera and start flicking away on our walk to the first location of our lecture. The cold numbs my fingers so much that pressing the shutter button becomes almost impossible. People at The Hague are cold and serious, their faces tell no tales. In my few locations of travel, I have come to appreciate that people’s faces tell you whether you are welcome or not. Here, I could not tell what their faces held. Nonetheless, The Hague is extremely organised, and clean and people are disciplined to a fault. I almost jumped in excitement when a police car stopped at a zebra crossing for me to cross. The order was unlike anything I had witnessed in any other place and yet, to me it appeared plastic. I appreciate that a human society can be that organised but part of me was left searching for a semblance of disorder as the beauty of a place, or even a human, lies in the imperfections. A few days later, I am on a not so smooth paved road in an air conditioned Mercedes bus staring into green sprawling fields of some kind of crop. The cars are less clean; the bus itself is more rickety and has a few torn seats. We had arrived in Rome after a two-hour long flight from Schiphol. The airport looks fairly modern and that gave me an impression of just another developed and organised European country. This impression soon changed when I got into the city centre. The city’s old buildings ooze of history and it appears as if all buildings have a story to tell; it is a modern day city that has kept its roots. It feels Biblical even; I ogle at the marble floors that I am yet to see lining the steps of any building elsewhere. My mind shifts briefly into my History classes in high school where I learnt of the Roman roads and how the technology evolved to the present tarmac. I see those same roads, aged but fully functional. All those centuries later and the roads that were used by the rulers of the Roman Empire in their display of power and opulence are there, unfazed by time and modernity. A quick shower later, and I am back into the city centre feeling the walls and I realise that unlike the Dutch, the Italians are more relaxed and a bit more informal. Small restaurants dot the beautiful city and there’s music flowing from one street that slowly ebbs into the cracks of the magnificent buildings. As I walk in those streets; I realise that drivers are brash and impatient; there are beggars in the streets albeit clean ones, few people jump traffic lights and these imperfections only add to the experience that is Rome. The food there is simply tangy and well made, it feels passionately prepared and this also applies to the gelato that negates all other ice cream that I have ever eaten. Rome by night only adds to its alluring vibe, there are less people yet couples are walking hands clasped and the whole city appears to have its own rhythm. It is no wonder that the city receives over 4 million tourists every year. The weekend in Rome is blissful, the Colosseum stands there like a cookie that is half bitten and I am flabbergasted at how a structure completed in around AD 80, was still standing. The walls are straight and well laid out and the symmetry appears to be well in line. Furthermore, St Peter’s Basilica is a work of art, as is all of Rome, only that it appears pristine and well looked after. So far the dream that is Rome just keeps unravelling at every street, and as I have my final gelato walking back to the hotel, I have this urge in me to travel and to see more. I leave Rome definitely hoping to be back later in life. Finally, there’s Dubai where the experience is dulled slightly by a long flight and a lecture early in the morning that leaves me groggy and just looking for a bed. I catch a few hours of sleep and soon after I am on my way to the metro station. A few stations later I am standing in front of the Burj Khalifa staring into its glistening top. Dubai was a beautiful experience but rather short as we only had two days there, I was amazed to learn that the bulk of all the construction was done in the last twenty years and challenged me in that fifty years after independence Kenya is yet to get its act together. The night is cool and breezy; I am walking in and out of stalls trying to get some shopping done before my train ticket expires. I leave the malls and head back to the hotel room and realise that the trip is finally coming to an end. I ponder and reflect on the eventful past week. The experiences acquired are invaluable, and I am full of thanks to Strathmore for meticulously planning the trip, it was worth every second.